Here are some snazzy birthday facts about 27th of April 1962 that no one tells you about. Don’t wait a minute longer and jump in using the content links below. Average read time of 10 minutes. Enjoy! What day was my birthday Apr 27, 1962? April 27, 1962 was a Friday and it was the 117th day of the year 1962. It was the 17th Friday of that year. The next time you can reuse your old 1962 calendar will be in 2029. Both calendars will be exactly the same! This is assuming you are not interested in the dates for Easter and other irregular holidays that are based on a lunisolar calendar. 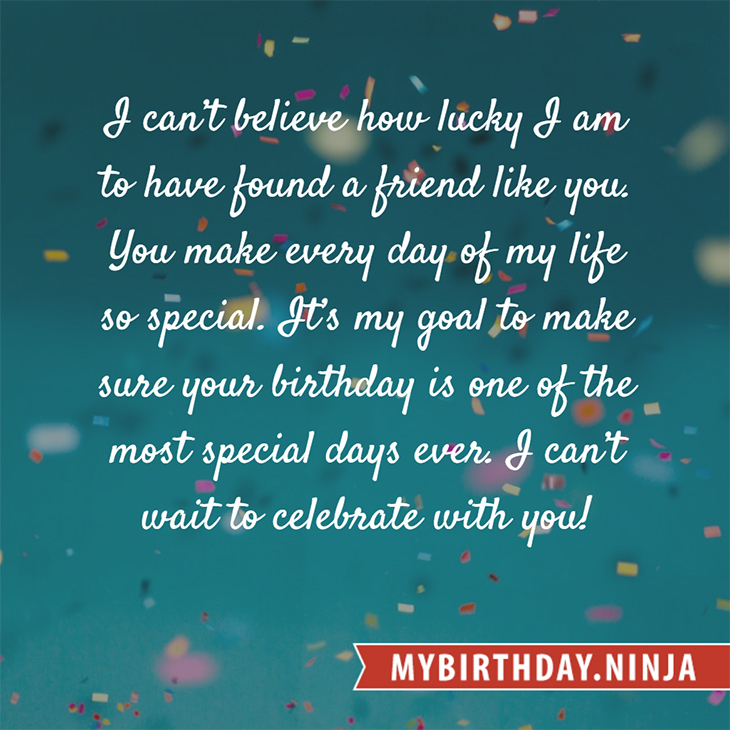 There are 5 days left before your next birthday. You will be 57 years old when that day comes. There have been 20,814 days from the day you were born up to today. If you’ve been sleeping 8 hours daily since birth, then you have slept a total of 6,938 days or 19.00 years. You spent 33% of your life sleeping. Since night and day always follow each other, there were precisely 705 full moons after you were born up to this day. How many of them did you see? The next full moon that you can see will be on May 18 at 21:13:00 GMT – Saturday. Fun stat: Your first one billion seconds (1,000,000,000) happened sometime on January 3, 1994. If a dog named Kazuhira - a Boxer breed, was born on the same date as you then it will be 272 dog years old today. A dog’s first human year is equal to 15 dog years. Dogs age differently depending on breed and size. When you reach the age of 6 Kazuhira will be 42 dog years old. From that point forward a medium-sized dog like Kazuhira will age 4.5 dog years for every human year. Shahrbaraz is crowned as king of the Sasanian Empire. American Revolutionary War: The Battle of Ridgefield: A British invasion force engages and defeats Continental Army regulars and militia irregulars at Ridgefield, Connecticut. The New York State Senate creates Cornell University as the state’s land grant institution. Operation Moolah offers $50,000 to any pilot who defected with a fully mission-capable Mikoyan-Gurevich MiG-15 to South Korea. The first pilot was to receive $100,000. Xerox PARC introduces the computer mouse. The April 27 demonstrations, student-led protests responding to the April 26 Editorial, during the Tiananmen Square protests of 1989. All members of the Zambia national football team lose their lives in a plane crash off Libreville, Gabon en route to Dakar, Senegal to play a 1994 FIFA World Cup qualifying match against Senegal. South African general election: The first democratic general election in South Africa, in which black citizens could vote. The Interim Constitution comes into force. The last successful telemetry from the NASA space probe Pioneer 10. What does my birthday April 27, 1962 mean? Your birthday numbers 4, 27, and 1962 reveal that your Life Path number is 22. It is a master number that represents practical idealism and material mastery. You were born under the most powerful and potentially the most successful of all Life Path numbers. The following celebrities also have the same life path number: Elias Koteas, Masaaki Uchino, Bobby Byrd, Simon Jones, Isabelle Severino, Lucie Arnaz, Julian McMahon, Mimi Keene, Art Garfunkel, Voula Zouboulaki. What is the birthday horoscope for Apr 27, 1962? The Western zodiac or sun sign of a person born on April 27 is Taurus ♉ (The Bull) – a fixed sign with Earth as Western element. The ruling planet is Venus – the planet of love and beauty. According to the ancient art of Chinese astrology (or Eastern zodiac), Tiger is the mythical animal and Water is the Eastern element of a person born on April 27, 1962. Fun fact: The birth flower for 27th April 1962 is Sweet Pea for love. 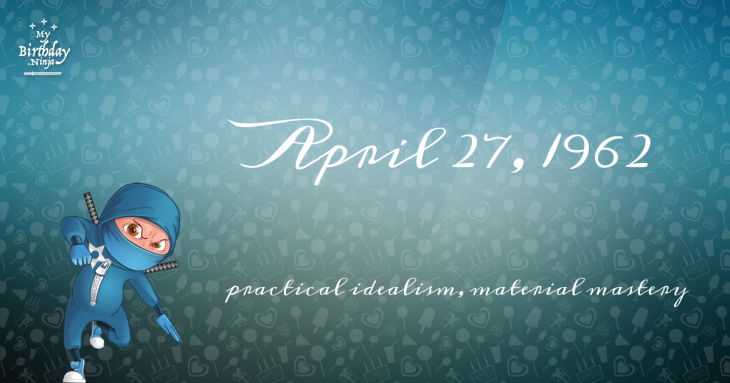 What is the Love Match for Apr 27, 1962? When it comes to love and relationship, you are most compatible with a person born on January 11, 1937. You have a Love Match compatibility score of +145. Imagine being in love with your soul mate. On the negative side, you are most incompatible with a person born on August 4, 1955. Your incompatibility score is -169. You’ll be like a cat and a dog on a love-hate relationship. Arf-arf, I want to bite you. Meow-meow, stay away from me! The number-one hit song in the U.S. at the day of your birth was Good Luck Charm by Elvis Presley as compiled by Billboard Hot 100 (April 28, 1962). Ask your parents if they know this popular song. I do not know how you feel about this, but you were a female ♀ in your last earthly incarnation. You were born somewhere around the territory of Northern Australia approximately on 850. Your profession was map maker, astrologer, astronomer. How many babies were born on April 27, 1962? Base on the data published by the United Nations Population Division, an estimated 111,558,191 babies were born throughout the world in the year 1962. The estimated number of babies born on 27th April 1962 is 305,639. That’s equivalent to 212 babies every minute. Try to imagine if all of them are crying at the same time. What is the popular baby name on 27 Apr 1962? Here’s a quick list of all the fun birthday facts about April 27, 1962. Celebrities, famous birthdays, historical events, and past life were excluded. Try another birth date of someone you know or try the birthday of these celebrities: February 6, 1978 – Yael Naim, French-Israeli singer-songwriter; December 3, 1975 – Malinda Williams, American actress; February 21, 1996 – Sophie Turner, English actress.